Find 0, 10, 25, 33 1/3, 50, 66 2/3, 75, 100, 200, and 250 percent of selected numbers. Find "7% of 300" for multiples and sub–multiples of 100 mentally. Explain how the identity for multiplication ["Every number times one (1) equals itself."] is used in renaming fractions. Explain how the identity for division ["Every number divided by one (1) equals itself."] is used in reducing fractions. Explain why division by zero (0) is not allowed. Find half and a quarter of all whole numbers up to 100. Find three–quarters, one–third, and two–thirds of selected whole numbers and fractions. Count by 1/2s, 1/4s, 3/4s, 1/3s, 2/3s, 11/2s, 21/2s. Find "2/3 of 12" for appropriate fractions and whole numbers. Find the part when the fractional part and whole are given. "2/3 of 24 equals what number?" Find the whole when the fractional part and part are given. "3/4 of what number equals 9?" Find the fractional part when the whole and part are given. "8 is what part of 12?" "The distance around the Earth is about 24,000 miles. At 3 inches for every 500 miles, about how many inches would it take to represent the distance around the Earth?" 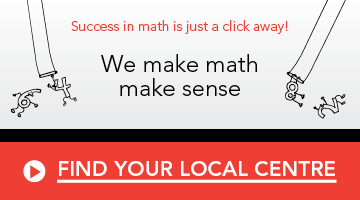 Learn more about our middle school math program.